The #1 bestselling chapter book series of all time celebrates 25 years with new covers and a new, easy-to-use numbering system! Camelot is in trouble! Jack and Annie must find four different kinds of writing that will help. Their quest leads them to the American Revolution, the American Civil War, the stormy Great Plains, and the great San Francisco earthquake. It's a difficult and dangerous mission, but Jack and Annie will do anything to save Camelot! 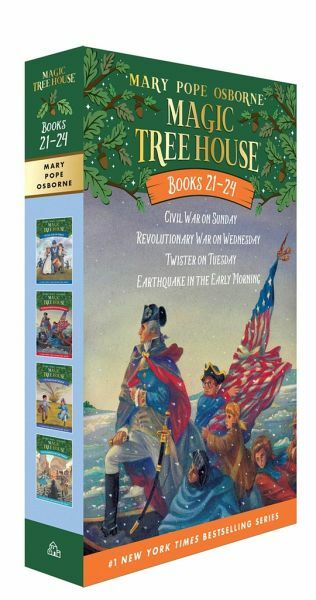 Books in this set include: Civil War on Sunday (#21), Revolutionary War on Wednesday (#22), Twister on Tuesday (#23), and Earthquake in the Early Morning (#24). Did you know that there's a Magic Tree House book for every kid? Magic Tree House: Adventures with Jack and Annie, perfect for readers who are just beginning chapter books Merlin Missions: More challenging adventures for the experienced reader Super Edition: A longer and more dangerous adventure Fact Trackers: Nonfiction companions to your favorite Magic Tree House adventures Have more fun with Jack and Annie at MagicTreeHouse.com! MARY POPE OSBORNE is the author of the New York Times number one bestselling Magic Tree House series as well as co-author of The Magic Tree House Fact Tracker series, along with her husband, Will, and her sister Natalie Pope Boyce. SAL MURDOCCA has illustrated over 200 children's trade and textbooks. He currently teaches children's illustration at Parson's School of Design in NYC.